Remember this guy from my post If I Were the Boss of the World? He was at the dog run with Yolanda and the ASPCA when I went to photograph dogs in need of adoption. Well I just saw him in New York Social Diary's party pictures from the ASPCA's Bergh Ball. Click on the link and scroll down to see him there. 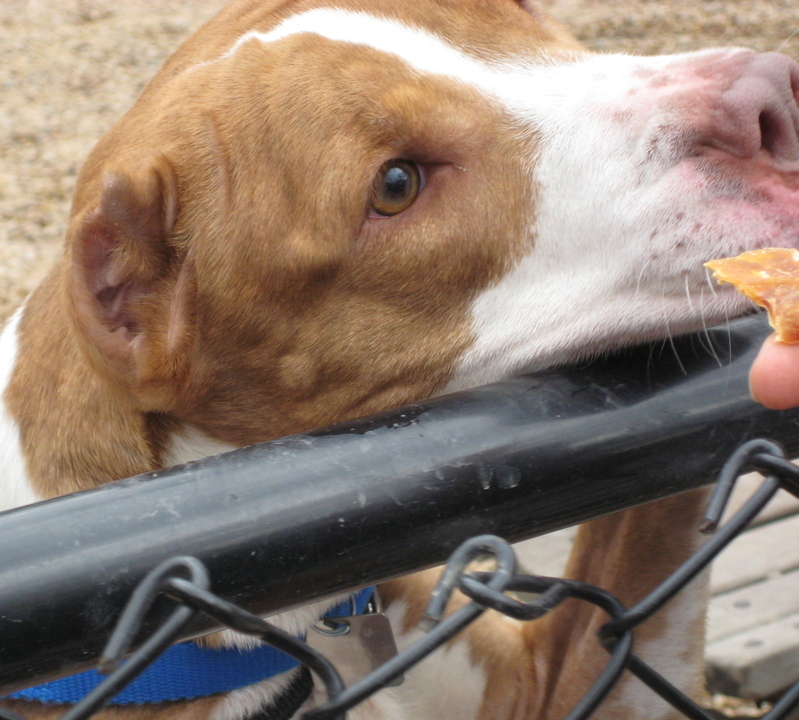 The ASPCA must consider this poor earless pit bull to be highly adoptable if they took him to the benefit. They have had him since at least March 7th, when I took this picture. I am sad to find he has not yet found a home. But at least they have not euthanized him. we met him at the party and i mentioned to chappy that you had photographed him. he is a very special dog -- calm, gentle, like an old soul. i really hope someone adopts him. I saw that you and Chappy were there too. How great that you recognized the dog. I want my sister to adopt him, but probably little chance. Since it is Wednesday I am going to see if the ASPCA brings hime to the run today so I can ask about him. I hope someone adopts him too. I would do it if I had the space but I don't and I don't think work would be open to two dogs in the office. Frankie - find out the details on him. Our dog trainer may know someone who would like to adopt him. He does lots of placements - mostly for pitbulls and mixes. How old is he, where did he come from, etc.? I'm curious too.